Aaron Sheppard, the wunder twin. He and his twin sister, Casey, are from Kansas. I'm from Iowa. We lived next door to Aaron in a loft building in Williamsburg in 1999, where we had many Saturday afternoon rooftop barbecues and Sunday morning hammock brunches at the Right Bank and Sunday night "white trash dinners". 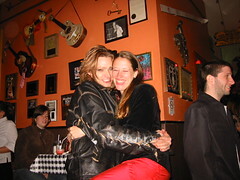 We met up again at the Cowgirl Hall of Fame when I was in NYC for a visit in the spring of 2003.